Glenda's Creative Place -Paper Crafting fun, CRICUT, CLOSE to MY HEART Consultant, Stamps, ... : I’m Back, I’ve Missed You All & I Have News & Money-Making Opportunities!! I’m Back, I’ve Missed You All & I Have News & Money-Making Opportunities!! First let me say that I never intended to be away from my blog this long and I’m really sorry for that, because I know that so many of you, my blog followers, really do care about and have been genuinely worried about me. Let me just sum it up by saying that it has been a very rough year+ with many changes and various medical issues. The majority of those medical issues have been outlined in detail on my personal Facebook page and if you’re interested, you can read all about them there. But here and now I am focused on going forward and have a new resolve to start anew! Some of the changes I’ve made involve aligning myself with some really great companies whose products I already use and love. I am now an Independent Consultant for Close To My Heart (CTMH), a premier crafting company that has been in business for over 30 years! I’ve been buying their products for years now and in fact, have alone been making over 1/2 of someone else’s quarterly goals for quite a while now, LOL!! So I finally decided to pay myself instead and to also get all my own supplies at the Consultant discount rate going forward! The reason I'm starting now is because I wanted to take advantage of the amazing special that CTMH is offering new Consultants in April, and I would love to help any of you who are interested as well, to take advantage of it as a member of my own team. If you join Close to My Heart for only $99.00 starting April 1-30, 2014, you’re going to receive a kit worth over $300.00, along with a choice of one of the Close to My Heart Cricut bundles (either Art Philosophy, Artiste or Artbooking). As an another added incentive, if you join MY CTMH team, I will be doing a drawing among my new team members and one of you will win an additional Close to My Heart Cricut Bundle!!! And just to make it even better, every single one of you that sign up as a member of my Close to My Heart team, will also receive an additional gift directly from me, consisting of assorted paper crafting supplies, valued somewhere between $10.00 to $20.00 (average $15.00). So, when you join my Close to My Heart Team during the month of April 2014, you are getting over $438.00 worth of products for only $99.00 (before tax and shipping)! Plus it includes your choice of ONE of the Close to My Heart Cricut cartridge bundles - Art Philosophy, Artiste or Artbooking! Plus additional paper crafting supplies from me!!! 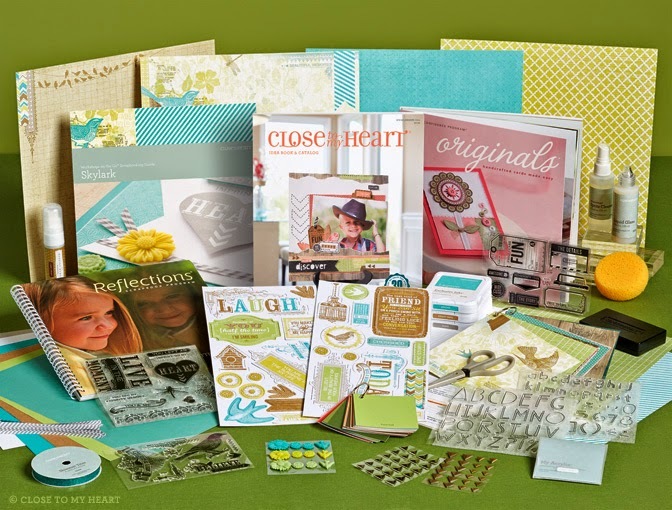 Plus the chance to win yet another Close to My Heart Cricut cartridge Bundles from Glenda!! And as if that wasn't enough, because I am a "regular" retailer for hundred's of other manufacturers as well, my team members will be able to place a group order 1-2 times each quarter (depending on how much we all need to order) with me and will receive 30-35% off the MSRP (Manufacturers Suggested Retail Price) for all those products. These other manufacturer's are too numerous to mention, but just to name a few, they would include Tim Holtz products, Ranger, Spellbinders, Sizzix, 7Gypsies, Memory Box, My Favorite Things, American Crafts, Project Life, Copic, Spectrum Noir, Clearsnap, Graphic 45, Glue Dots, Xyron, Pink Paislee, imaginisce, Teresa Collins, Craftwell, Tattered Angels, Glitz Design, and many, many more. If you are interested in joining my team, please start here on my CTMH site: http://glendascreativeplace.ctmh.com/ctmh/what-we-do/be-a-consultant.aspx and also please email me at glendascreativeplace@yahoo.com - and PLEASE put the words "GLENDA'S TEAM" in the email subject line!! And BTW, as long as you live in the U.S.A., you can be a member of my team and I'd love to have you!! We're going to have a lot of fun, we're going to learn a lot, and I will help each of you to be as successful as you want to be!! Q: Why would I sign up to be on your team? A: To get lots of free stuff, to have tons of fun, and learn how to do really cool stuff with paper, stamps, glue and other pretty stuff, LOL!!! 1) You can sign up on my team, order the Consultant kit (worth $309.00--hello--you already are getting triple what you paid for!! ), and in April only, also get the free CTMH Cricut bundle of your choice (worth another $99.00--hello hello--now it's 4 xs worth what you paid for it!!! ), plus all the other goodies I've listed (more than $438.00 worth for only $99.00) with NO FURTHER OBLIGATIONS to sell anything at all!! It's just a fabulous way to get a FREE CTMH cartridge bundle when join in April only--Plus the fabulous Consultant Kit, PLUS you get a 22% discount on anything you happen to sell or that you order for yourself thru September 2014. Purchase for yourself, and maybe some friends just as a "hobbyist". You don't have to meet a quota until the 2nd quarter after joining--in other words, not until September 2014!!! And if you don't make it, just drop out then--no harm, no foul. You get to keep all the goodies described above and you will have been able to order all that time using your 22% discount!!! 2) Sign up to be on MY TEAM, get the kit that's worth $309.00, and in April only, also get the free CTMH Cricut bundle of your choice (worth another $99.00), plus all the other goodies I've listed (more than $438.00 worth for only $99.00). Become a "Business" Consultant who wants to sell and earn extra money and other free products on a monthly basis. You will have a $300.00 Quarterly quota to meet (but if you join in April, you won't have to meet that quota until your 2nd quarter as a Consultant (July/August/September) which is easy to do just with your own purchases, co-workers, family, friends, etc.and easy to do online if you want to with all your cyber friends!!). You get the 22% discount on what you order, but there are also many smart practices we'll teach you to help boost those earnings!! You decide what you want your earnings to be and it's my job to show you how to get there!!! Thanks a lot pertaining to an additional superb publish. Wherever different might anyone get of which sort of details in such the best means of writing? I’ve a new business presentation a few weeks, as well as I’m within the hunt for like details. Over $300 worth of Free Product! !